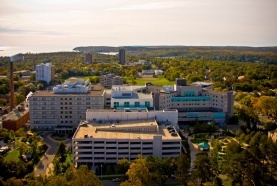 Thanks to our excellent faculty and our strong relationship with one of Canada’s leading children’s hospitals, you’ll find plenty of outstanding programs in our department. We have a long history of innovative clinical and basic science research, thanks to our abundance of grant support and our exceptionally productive and dedicated researchers. We are proud of the contribution our faculty, researchers and administrators make towards protecting and caring for children living in the Maritimes. The Department of Pediatrics partners with community-based health care providers, like the IWK Health Centre, to provide specialized care for children, youth and women from across Atlantic Canada. From cardiology to pediatric palliative care, one of our key goals is providing care "closer-to-home" through Maritime outreach clinics. Learn more about our 16 clinical divisions and two clinical services.